***This post contains affiliate links, which means should you click on a link and make a purchase, an FCS Team Member may be compensated. Spring is about ready to be sprung upon us…are you ready? There’s nothing better than shedding the heavy winter clothing and putting on new Spring clothes for the occasion. 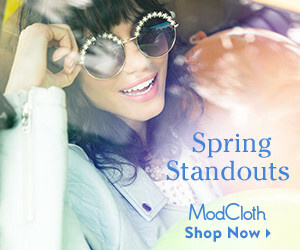 If you’re aching for some new Spring clothing – ModCloth has you covered this Spring. Their new Romantic Road Trip Style Collection is comprised of a lot of cute attire. Take a look at these items below. One can wear them to start off the day and then head right into the night without a worry. I absolutely love the sandals! Paired with the items you see in the image – what a great outfit(s) this would make for so many Spring occasions. I don’t know about you, but when purchasing Spring clothing I look for items that will do double/triple duty. For instance, pants that would work well during the Spring months that will carry throughout the summer as well, that can be dressed up or down, and worn into the night. The same with tops. For footwear, sandals of multi-colors work best for the Spring & Summer months, as then I don’t have to worry about packing a lot of footwear if we’re headed out for more than a day. What do you find that works for you? I know a lot of women like to have a lot of clothing, a lot of shoes, and a lot of handbags…not a necessity for me. Regardless, why not head over and shop the ModCloth Romantic Road Trip Style Collection. New – ModCloth Private Label Brands!